David George Sanborn, 81, a member of the Winona Lake (IN) Grace Brethren Church and father of Grace College music professor Tim Sanborn, died Tuesday, April 14, 2009, in Kosciusko Community Hospital, Warsaw, Indiana. Sanborn was born April 17, 1927, in Ferndale, Michigan to Glen M. and Mary E. (Steere) Sanborn. On August 21, 1954, in Ypsilanti, Michigan, he married Cynthia Joan Stralnic, who survives. 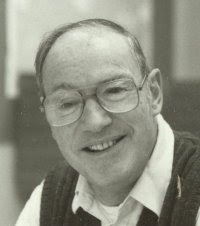 Sanborn dedicated his life to the influence of young people in numerous ways including teaching music in the public schools for nearly 40 years. He taught at Chelsea High School, Chelsea, Michigan, and at Lakeview High School in St. Clair Shores, Michigan. He also taught preschool music for various Montessori schools near Detroit following his retirement. Having come from St. Clair Shores, Michigan, to Winona Lake, Indiana, in 2003, David was a member of Winona Lake Grace Brethren Church. Other church memberships had included Calvary Baptist Church in Roseville, Michigan, and Bethany Baptist Church in Clinton Township, Michigan, where he served as deacon. He belonged to Gideon’s International, Voice of Christian Youth ministry, the Orff-Schulwerk Association, Michigan School Vocal Association, was active in Youth for Christ, taught Sunday School and was in the Civil Air Patrol. Sanborn played string bass and tuba in the St. Clair Shores Symphony and Ann Arbor Symphony as well as with numerous Detroit area groups. Most recently he participated in the Grace Community Wind Ensemble and volunteered at Jefferson Elementary School, both in Winona Lake. He loved ice cream and dogs. He also enjoyed fishing and camping. A devoted father and husband, he is survived by his wife, Cynthia Sanborn, Winona Lake; two sons and daughters-in-law: Tim and Ruth Sanborn, Winona Lake and David and Cathy Sanborn of Keystone Heights, Florida; two daughters: Nancy Kilpatrick of York, Maine and Beth Sanborn of Plymouth, Michigan; five grandchildren: Benjamin Sanborn and Michael Sanborn, both of Winona Lake; Joel (and Stacey) Kilpatrick of Northville, Michigan; Daniel (and Laura) Kilpatrick of Loma Linda, California; Andrew Kilpatrick of York, Maine; and one great grandson, Lukas Kilpatrick, Northville, Michigan. David was preceded in his death by two sisters: Mary Alice Hayes and Betty Higgins. A time of sharing with the family will take place from 2-3 PM Friday, April 17, 2009 at Winona Lake Grace Brethren Church with a celebration of David’s life beginning at 3 PM also at the church, 1200 Kings Highway, Winona Lake. There will be a second service in Clinton Township, Michigan Sunday, April 19, 2009 at 4 PM with visitation one hour prior at Bethany Baptist Church. Gifts in memory of David may be made to Children of the Nations (COTNI), PO Box 3970, Silverdale, Washington 98383 or at their website: www.COTNI.org. I am sorry to hear of the passing of Mr. Sanborn. Many times like this, I've searched for him to give thanks for the exceptional voice training he gave me when I was a student at Lakeview High School. Although I all but abandoned my musical ambitions for a couple of decades, his attention and ability flash back when I remember all the people who helped me develop my voice. I'm now pursuing music as a career and would like to give his family a CD of my first album "From Primal to Divine", in memory of Mr. Sanborn's diligent and capable instruction and the impact it had on my life. David Sanborn was an exceptional voice teacher and choir director. Thank you Mr. Sanborn. May you rest in peace.